SINGAPORE — When the Ferrari phone call finally came, Formula One driver Charles Leclerc shouted to his friend to turn the engine off. The name of Ferrrari's team principal flashed on Leclerc's screen last Saturday. "I was on a friend's boat, a motor boat which makes a lot of noise," Leclerc said Thursday at the Singapore GP. "The phone was vibrating and then I saw Maurizio Arrivabene's name. "We were right in the middle of the sea, so I told my friend 'cut the engine, turn everything off, because I have to take this call.'" Moments later, Leclerc celebrated the rare thrill of being named a Ferrari driver — at the even rarer age of 20. "I jumped in the water," said the man from Monaco. It has been quite a leap for Leclerc, who has impressed enough in his debut season with Sauber to replace 2007 F1 champion Kimi Raikkonen at Ferrari next year . But for someone who grew up in an apartment overlooking F1's most famed track, and played with toy Ferrari cars as a young boy, it might seem like fate. "Since I was really little, I always dreamed of driving for Ferrari," Leclerc said. "I called my mother straight away to tell her I'd signed. She thought it was incredible." Raikkonen has six podium finishes in the past seven races, and secured a brilliant pole position at the Italian GP two weeks ago. Ferrari thought about giving the 38-year-old Finn another contract. After all, he has won 20 races and secured 100 F1 podiums, despite taking two years out at his peak to try his luck at rally driving. Raikkonen also has a close working relationship with Sebastian Vettel, Ferrari's other driver. The odds, therefore, were not stacked in Leclerc's favor. "It was difficult. I didn't really know what was going on in the background at Ferrari," Leclerc said at Sauber's motorhome. "I really needed to know the decision, and quickly." After joining Ferrari's prestigious academy in 2016, Leclerc won the GP3 title at the first go. Ditto last year, when he clinched the F2 title. 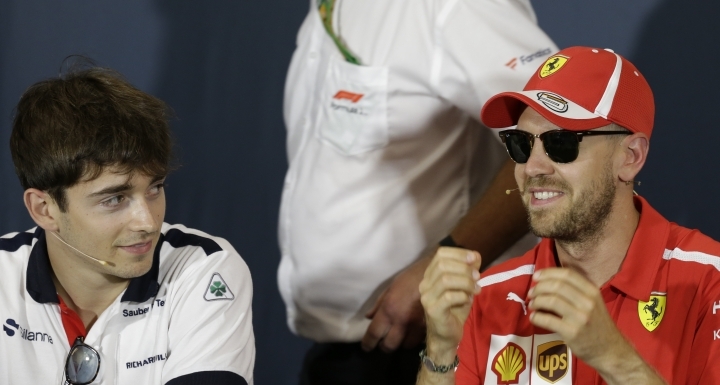 "I think the hype is absolutely justified," Vettel said of Leclerc. "(If) you walk through all the categories like that, then you belong here." Leclerc quickly caught the eye in F1 by finishing an impressive sixth, this with one of the slowest cars, at the Azerbaijan GP in April. "If you're fast and talented then the age doesn't matter," Vettel said. "It's great he gets the opportunity to race in a big team." 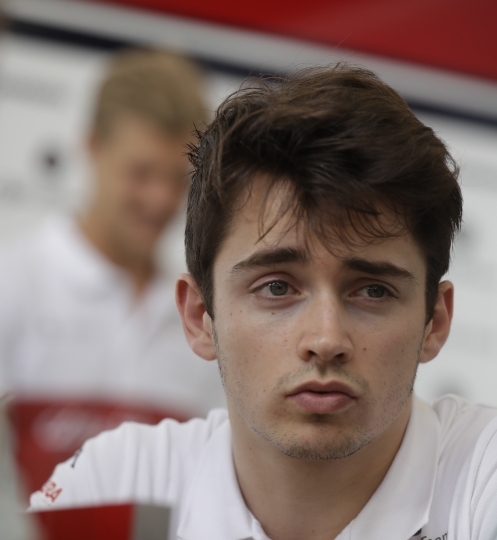 Leclerc is ambitious and — without being brazen — confident of competing against Vettel. He does not necessarily see himself as No. 2 to the German driver, who has four world titles and won 52 races. "For me it's clear: in any team there is not a No. 1 and a No. 2 driver from the outset," Leclerc said. "That becomes clear after a few races." He considers mental strength his strongest asset. "I don't know if I handle pressure better than others, but I don't really feel it much," he said. Leclerc experienced grief three years ago when F1 driver Jules Bianchi died. The two were childhood friends. When Leclerc started go-karting before the age of four, it was on the track owned by Bianchi's father, who was a close friend of Leclerc's father, Herve. Bianchi mentored Leclerc in his karting years, and was himself touted as a future Ferrari driver. Bianchi died in July, 2015 after having battled to recover from head injuries sustained in a head-on collision at the Japanese Grand Prix in October 2014. He was 25. Leclerc's father also died in June last year, a few days before the F2 Azerbaijan GP. He still took pole position and won. So next year, Leclerc won't just be driving for Ferrari. "I'm very happy to be going to Ferrari, where Jules deserved to go," he said. "I will do my maximum to get the best results for him, and for my father." Copyright © 2015 - 2019 Sports - Malaysian Talks. All Rights Reserved.